Do you enjoy biscotti? 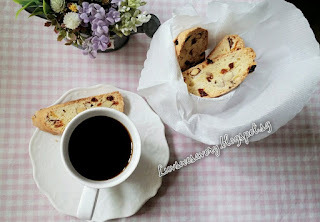 I simply enjoy dunking crunchy & nutty biscotti in coffee. Preheat oven to 180°C. Position the rack in center of oven. *Note : The temperature of the oven may vary, do adjust accordingly. Line a large baking tray with baking paper. Set aside. Using an electric mixer, beat egg, sugar and lemon zest until thick and pale. Add in the lemon juice and continue beating till combined. Sift over flour and baking powder. Add almond and apricots. Stir to combine with a spatula. Turn out onto a lightly floured surface. Knead lightly until smooth. Shape into a 20cm long log. Place on prepared tray. Flatten slightly. Bake for 30 minutes or until golden. Cool on tray for 15 minutes. Reduce oven temperature to 140°C. Gently transfer the log onto a cutting board. Using a serrated knife, slice log diagonally into 5mm-thick slices. I reused the baking paper. Place slices, in a single layer, on baking tray. 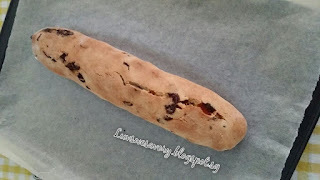 Bake for 20 to 25 minutes, turning halfway through cooking, or until dry and crisp. Stand on tray for 5 minutes. Transfer to a wire rack to cool completely. Hey, you can read my mind! Haha! I was craving for some biscotti and thought of baking some soon. 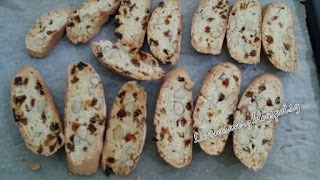 I like biscotti! 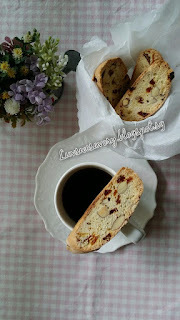 Your apricot lemon biscotti looks really good! I'm all for theraputic baking. These look wonderful Karen!! !